The ‘Green Trend’ is more prevalent now than it has ever been, not only in the cleaning industry but in all walks of life. It is rightly affecting the way we think about waste disposal issues. At 1st Green Clean, we always promote recycling, re-purposing and in using Eco-friendly products. We are pleased to offer advice on any cleaning issues. 1st Green Clean is here to help you and meet your environmental friendly cleaning needs. 1st Green Clean uses green seal certified and Eco-friendly solutions and cleaning products that have been certified and bare the green seal, we strive to achieve a healthier and cleaner environment by identifying and promoting products and services that cause less toxic pollution and waste. Schedule a free consultation with us and we'll answer all of your questions about the many healthy benefits of Eco-friendly cleaning. 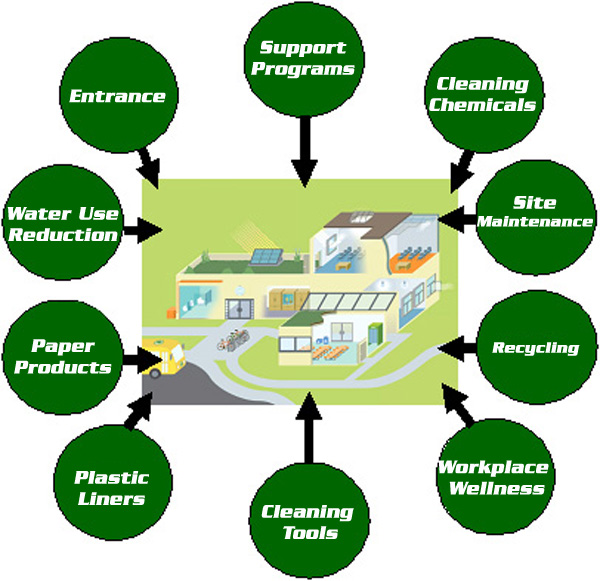 Advantages of Green Cleaning Services and technology now allow for products that clean with less aggressive ingredients. Eco-friendly cleaning assists in reducing exposure to potentially harmful chemicals that can endanger the health and safety of building occupants, visitors and the cleaning staff; plus, reducing negative impact on the environment. We know you enjoy a clean environment, so why not enjoy the full spectrum of benefits and rewards that 1st Green Clean can bring to you .....with Eco-friendly cleaning?